When traveling in your RV, you want all of the accommodations of home. While that means that you need to include many of the modern appliances you enjoy on a regular basis, climate control is another essential component. Thus, having the best RV air conditioner should be one of your priorities when installing various elements into your mobile home. These machines ensure that you feel comfortable and cool at all times. Today we’re going to be looking at some of the top models of RV air conditioner, as well as go over how to install them and what you should be looking for the most. Whether you’re a full-time RVer or you only travel on occasion, these tips should be valuable in your decision-making process. One of the best things about the Brisk II Air Conditioner is that you can choose the size that’s right for your RV. Depending on the interior space of your rig, you may decide that you need a little bit more power, meaning that the 15,000 BTU model is ideal. For the most part, when you have at least 12,000 BTUs, you can cool a space of up to 550 square feet. Once you get up to 15,000, you can manage an RV with about 1000 square feet of space. Overall, you can depend on the Brisk II to work quickly and efficiently. Also, being able to choose the best size for your RV means that you’re not overworking it, which helps it last longer and require less maintenance and upkeep. Another element that we appreciate about the Brisk II is that you can install it in virtually any RV, whether it comes with ducts or not. For the uninitiated, the difference is whether the cold air will come out of a single point or multiple ones. Ducted RVs will disperse the air to each duct in your RV, while non-ducted units will simply blow air out of the bottom of the machine. Overall, the Brisk II can accommodate almost any RV, making it one of the best choices out there. I appreciate the fact that the Brisk II offers customizable features to fit your needs. Also, being smaller and lighter than older models, you can install it much easier. With some RV air conditioners, you have to pay a professional to make sure that everything gets hooked up correctly. With Dometic, you should be able to do it all yourself. As with any complicated machinery, each model may not be built to the same exacting standards. Thus, there may be cases when you have an air conditioner that either makes noise or has a faulty compressor. Fortunately, if you buy directly from Dometic, it should be covered under warranty. As we established with the Dometic Air Conditioner above, you can cool a massive interior space when you have access to 15,000 BTUs. Thus, this model from Atwood is perfect for both medium and large-sized RVs. Since this is a non-ducted model, you have to make sure that it’s compatible with your rig. However, if you have ducts, you may be able to get a different mounting bracket to enable this machine to work. That being said, you’ll have to check to see if that will void any warranties. When compared to other air conditioners in its class, this unit is high-powered and extra efficient. Even without ducts, you can expect to cool your RV in no time. It can move up to 360 cubic feet of air per minute. Although this machine is listed at 15,000 BTUs, it feels like it’s an 18,000 BTU model. That’s how durable and reliable the motor is. With some RV air conditioners, you may be able to cool your rig, but at the expense of making a lot of racket in the process. While it’s impossible to avoid any kind of noise with your A/C unit, this model is one of the better options out there. If you have it running at night to combat the summer heat, you’ll love that it won’t wake you up every time it kicks in. This is one of the better high-powered units out there. Obviously, if you have a smaller rig and you don’t need this much cooling capacity, it may be overkill. However, when compared to other high-efficiency models, this one is decent and reliable. I would prefer if this unit came ready to install, but you do have to buy an Atwood mounting bracket to make sure that it works correctly. Also, it’s a bit pricier, although considering its usefulness, it should be considered as an investment, not an expense. Technically speaking, this air conditioner unit is built for ducted RVs. That means that you have to have sufficient airflow to get through all of the ducts in your mobile home. Fortunately, with a ⅓ horsepower fan, that’s not an issue. The airflow rating for this conditioner is 320 CFM, making it one of the most powerful and efficient units you can find. With 15,000 BTUs, this machine will help keep your rig cool, no matter how large or spacious it is. Although this model doesn’t come with a heating element, you can buy the accessory so that it will be much more useful all year round. When you add the heating element, you can get up to 5,600 BTUs, meaning that staying warm in the winter and cool in the summer has never been easier. If you have a ducted RV, then this will be one of the better air conditioner units you can find. With a high-powered system that keeps the air flowing well, you’re sure to have a cool and comfortable interior in no time. Compared to the whisper-quiet operation of the Atwood model above, this A/C is much louder. Also, installation can be tricky if you don’t know what you’re doing. I would advise professional installation if possible. Compared to other A/C brands for RVs, Dometic is one of the most widespread and well-respected. Part of the reason for that is the fact that you can get such performance from a smaller unit like this one. At 13,500 BTUs, you can cool most RVs down pretty quickly. Best of all, it can work well with both ducted and non-ducted systems, making this one of the most versatile and reliable A/C units you can find. One of the primary selling points for this air conditioner is the fact that it comes with a slim profile. In fact, it’s the thinnest in the industry. Having such a thinner outline makes it easier to install (less weight) and makes the whole thing work more efficiently. Although this air conditioner will work better with ducted RV systems, the fact that it’s powerful and efficient enough for either is a major win in my book. Also, the thinner profile does improve the installation process and ensures that you’ll love the look and feel of this A/C. There isn’t much to dislike about this air conditioner. It’s certainly not the most powerful unit we’ve seen, but since you already know about that ahead of time, it shouldn’t be an issue for most buyers. You should already be familiar with the Coleman brand, especially when living the RV life. These products are built to exacting standards that help the company become synonymous with high-quality performance. In this case, we have a combination heater/air conditioner that can operate at up to 13,500 BTUs. This strength is enough to work well inside most RVs, although it is ideal for ducted systems to ensure proper distribution of both hot and cold air. Another primary selling point of this air conditioner is that it won’t break the bank by using up all of your energy when in use. Although this model is a bit bulkier (and louder) than other A/Cs, it’s still highly efficient and will keep you cool without making your utility bills skyrocket. I’m already a fan of the Coleman brand, but I like that this is a sturdy and reliable air conditioner. You can install it knowing that it will work time and time again. While not the most powerful option, it’s much more efficient than most other A/Cs in its class. Installing this air conditioner is relatively easy, provided that you don’t have any problems lifting it into place. Also, even though it’s highly efficient, it can be a bit loud when pumping out air at full capacity, so keep that in mind. Now that you’ve seen some of the top A/C units for your RV, let’s look at the various features and elements that will help you make the right choice for your rig. Since no two RVs are the same, you have to make sure that your air conditioner will be compatible with your mobile home. What BTU rating should an RV Air Conditioner be? One of the most crucial elements of any air conditioner (RV or otherwise) is how well it can perform. While the number of BTUs shouldn’t be the only thing you pay attention to when comparing different units, it can give you a good idea of how well the A/C will work in your RV. Here is a handy guide to help you figure out the size you need. As you can see, an ideal BTU rating will be around 15,000, assuming that you have a Class B or Class A motorhome. If you have something smaller (like a camper van), then you won’t need as many BTUs. Overall, this number should serve as a guideline, not a hard and fast rule to determine which A/C is better than another. The fact is that other elements like airflow, duct vs. non-ducted, and installation procedures will tell you which model is right for your needs. Some high-end models may be more efficient at spreading the air throughout your RV, meaning that you can get the same cooling effect with fewer BTUs. Finding the perfect A/C for your RV is the easy part, relatively speaking. Once you have the machine, though, the installation is a whole other issue. Here is what you need to know about installing an RV air conditioner. Because this appliance installs on the roof of your RV, you want to be extra careful when installing it. Some of these air conditioners can be more than 70 or 80 pounds, so you want to make sure that you’re not going to hurt yourself or drop the machine by accident. If necessary, get help when installing your A/C. Not only will assistance make it easier to get the A/C into place, but consider how you’re going to get it up to the roof in the first place. Also, keep in mind the weight of the old A/C unit. Since you’ll have to remove the old conditioner and bring it down, you need to be extra careful so that it doesn’t fall and smash on the ground (or on something more valuable). Because air conditioners are all about condensing air to make it cooler, water is a natural byproduct of this process. Thus, you need to be aware that you’ll have to mop up water leakage when replacing your old unit. Even if you haven’t used the A/C in a while, there could still be water inside the various components. Since water can make handling it more slippery and unsafe, you need to watch out when moving the old conditioner. If you’re replacing an A/C unit, then you already know where to install your new one. However, if you’re installing one from scratch, then you’ll have to do some research and inspection to make sure that you’re putting it in the right place. If you don’t have an air conditioner already, then chances are that you don’t have a duct system. Thus, you need to be sure that you’re mounting the A/C where it can have the most effect. That being said, if you’re adding a secondary air conditioner for a particular part of your motorhome (i.e., the sleeping quarters), then make sure that it can be mounted there without damaging any valuable internal components. Overall, if you’re putting a new A/C in from scratch, then you may want to get a professional to inspect your rig to make sure that you’re doing it right. Also, since you’ll have to cut a hole for the unit, you may want to hire someone to get that done first. For the most part, you’ll be replacing an old air conditioner, so the most valuable thing to pay attention to is the fitting. Look at where the pieces attach on both the outside and the inside. When removing the old A/C, you’ll have to take off the shroud first (the plastic cover), as well as remove the bottom console. Then you can pull the machine itself out from the hole. While you could keep the original gasket, it’s much better to peel it off and replace it with a new one. Chances are that the old version is cracked and worn anyway, so putting a brand-new gasket will help your A/C work better. When putting the new air conditioner on, make sure to do the gasket first, then mount the machine. Screw it into place so that it won’t move at all. Finally, you can attach the shroud and the interior console. During each step, be sure to pay attention to the installation instructions. You don’t want to have to redo anything later on because you messed up. Although cooling the air inside your RV is the primary purpose of your air conditioner, that’s not all it can do. In some cases, you may be able to install a model that comes with a heat pump. The advantage is that you can heat your interior spaces when it’s cold outside, as well as cool everything when it’s sweltering. When paying attention to the heat pump, you’ll still want to look at the number of BTUs. Also, see what the overall range is. Heating and cooling your RV is more of an art than a science, so remember that averages are all you can use. While it would be nice to be able to control your RV’s temperature precisely, you should recognize the limitations of these devices. Factors like the size of your interior spaces, any cracks in the facade, and other elements can affect an air conditioner’s performance. Are All RV Air Conditioners Compatible With all RV’s? Simply put, the answer is no. Depending on the size of your RV, you may need something larger or smaller to fit in the right space. That being said, many of these RV air conditioners work with a vast majority of motorhomes, so it’s not like each mobile home has a proprietary model. Also, keep in mind that the output of your A/C will matter as well. If you find two units that are the same size but one has 15,000 BTUs while the other only has 10,000, you’d do better with the former option. Another thing to consider is if your RV has ducts. Ductless models are not meant to work with internal ducting systems, so you don’t want to mix the two. Overall, check your owner’s manual to see what kind of A/C unit you can install into your RV without any issues. Why Would I Need to Upgrade My RV’s Air Conditioner? Although the answer to this question should be obvious, here are some reasons to upgrade to a newer model. Better Air Conditioning - a newer model may be able to spread cool air throughout your RV more efficiently. Heat Pump - if you know that you’ll be traveling in a lot of different climates, you may decide to get a combo A/C and heater. Less Maintenance - if you have to fix your old A/C all the time because it keeps breaking down, then upgrading will help you live worry-free. No matter which model you decide to get, it will wear down over time. However, the more you take care of your A/C, the better it will work for the long term. Here are some tips to help you get the most out of your air conditioner. Clean the Filters - it’s surprising how much dust and other particles are in the air. Over time, your A/C will accumulate all kinds of stuff that will have to be cleaned out. Otherwise, it won’t work as efficiently. Clean the Evaporators - wiping these down will help them work better, meaning that it takes less energy and time to cool the air and disperse it to your RV. Clean Condenser Fins - as with the evaporator, maintaining these fins will keep them working properly at all times. Constant Inspection - it’s easy to set your A/C and forget it, particularly if you use it a lot. However, you don’t want to get complacent. Set an inspection schedule and remind yourself every month or so to go over each component. Clean the Compressor - wipe it down and remove any dust or dirt. Ducted Units Require Extra Attention - dust and other particles will accumulate in the ducts of your RV, so you’ll have to try and clean them out regularly. Also, wipe down the dust vents as needed. One thing that many people do is set their A/Cs too low. While it may seem nice to set it at 60 degrees when it’s boiling outside, that will put too much pressure on the system. What you have to realize is that the air conditioner has sensors to determine the inside temperature. Thus, if you set the machine too low, then it will have to work harder and longer to reach that setting. Instead, you want to keep your A/C at about 70 degrees. When it’s over 80 degrees outside, that’s a huge difference, and it’s all it takes to feel comfortable in your RV. This temperature range is perfect because it’s much easier for your air conditioner to maintain this setting for longer periods. While hotter climates will cause it to kick on more often, it won’t overload the system. If necessary, set the temperature to about 75 to alleviate any issues. 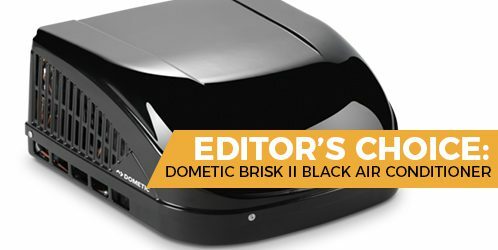 Although the best RV air conditioner can be hard to determine because everyone’s needs are different, we think that the Dometic Brisk II is the ideal option. With two BTU settings and a host of features that will keep the machine working properly for a long time, we know that you’ll love the way it feels inside your RV. The owner of this website, rvexpeditioners.com, is a participant in the Amazon Services LLC Associates Program, an affiliate advertising program designed to provide a means for sites to earn advertising fees by advertising and linking obd2pros.com to Amazon properties including, but not limited to, amazon.com, endless.com, myhabit.com, smallparts.com, or amazonwireless.com.